CANADIAN POP STAR Justin Bieber swept the American Music Awards on Sunday, topping strong competition from Rihanna and Nicki Minaj, and sending newcomers British boybands One Direction and The Wanted home empty-handed. 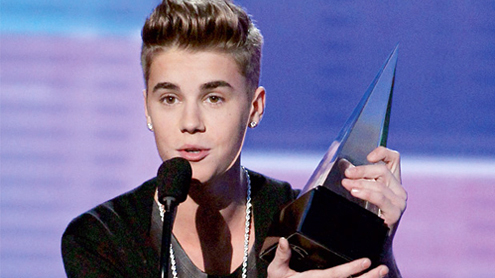 Bieber, 18, won all three categories in which he was nominated, including the night’s biggest award, artist of the year, over Rihanna, Katy Perry, Maroon 5 and Drake.“This is for all the haters who thought that maybe I was just here for one or two years, but I feel like I am going to be here for a very long time,” Bieber said on stage, dedicating his first win of the night to his mother, Pattie Mallette, who accompanied him after his widely reported split from girlfriend Selena Gomez. “It’s hard growing up with everything going on, with everyone watching me. I wanted to say that as long as you guys keep believing in me, I want to always make you proud,” Bieber said at the end of the night.Bieber, who also won favourite pop/rock male artist and favourite pop/rock album for Believe, took to a bare stage to sing an acoustic stripped-down version of his latest single As Long As You Love Me before livening up the show with Nicki Minaj for Beauty and a Beat. R&B singer Rihanna, 24, and rapper Minaj, 29, led the nominees going into Sunday’s awards with four apiece.Minaj won favourite rap/hip hop artist and rap/hip hop album of the year for Pink Friday: Roman Reloaded. The singer, known for her extravagant on-stage performances, sang her latest hit Freedom in a winter wonderland-themed set.Canadian pop singer Carly Rae Jepsen, 26, picked up the coveted new artist-of-the-year award. She performed her hit Call Me Maybe.“I am floored,” the singer said, thanking Bieber along with her fans in her acceptance speech.